As many 20th century Marvel readers are aware of (it seemed appropriate to actually cite the century, given our subject matter), Kang the Conqueror's road to conquest began in the year 3000 A.D., in an era of peace on Earth that he found intolerable. Discovering access to a time machine designed by his ancestor, he traveled back to ancient Egypt and took on the identity of Pharaoh Rama-Tut, where he planned to establish a base of operations for himself and then begin raids of conquest throughout time. 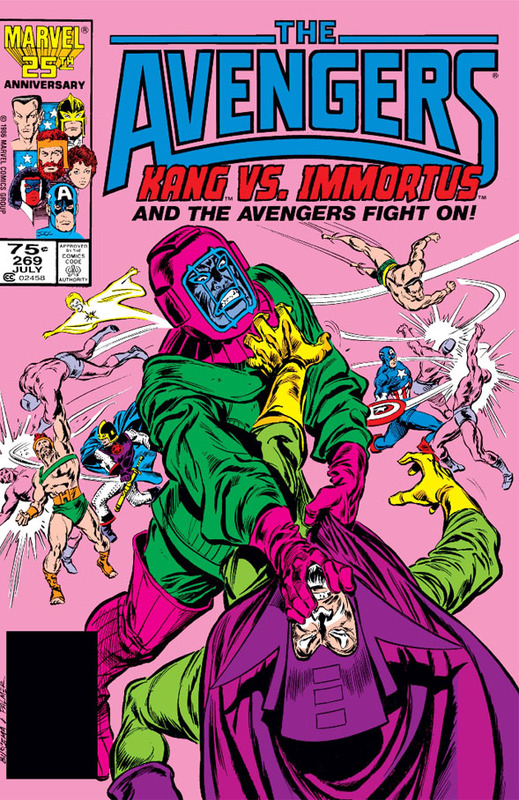 Yet as we've seen evidence of recently, Kang actually hails from an alternate reality--a parallel Earth that endured a shocking history of destruction and decimation well before even our first world war. The Earth on which Kang was born rose from its ashes--and ironically, it was Kang's own ancestor who was responsible for the peace that he found he couldn't bear. Since we're talking about a time machine, and the fact that Kang's ancestor conceived its design, the original story by Stan Lee from Fantastic Four Annual #2 that followed up on the Rama-Tut tale implied that the ancestor in question was either related to Dr. Doom or was Doom himself; but when that connection was invalidated by writer Roger Stern's Avengers story from 1986, the same story underscored a revelation from a Fantastic Four story from '84--namely, that this ancestor was in fact Nathaniel Richards of our own Earth, the father of Reed Richards. Some family tree, eh? Imagine Thanksgiving at the Richards table. "Pass me that turkey leg or I'll conquer your puny century!" So to complete the circle on this subject, it might be interesting to review scenes from John Byrne's 1984 story and have a look at the fate of Earth, a virtually destroyed world that would in time produce a ruthless conqueror--a story that begins with Reed's search for his missing father, a search which led to that same parallel world where Reed gained historical information from the queen who led a rebellion against none other than his own father, a man who on this world is known as the Warlord. In the tale that Reed hears, it seems Earth's course for disaster was set with an event which, on our Earth, symbolized national pride and achievement. 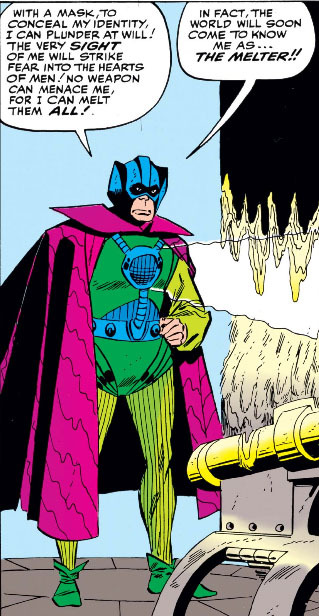 There was a time when I mentioned with a reasonable amount of presumption that the history of Kang the Conqueror was so convoluted that there weren't likely that many people who would want to take a crack at charting it, or words to that effect. 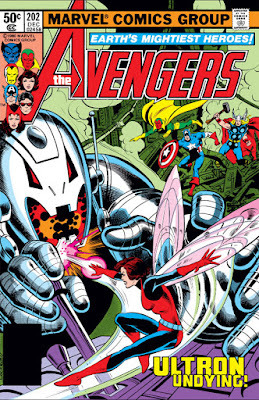 But in a mid-1986 Avengers story, writer Roger Stern makes a respectable attempt to do so, at least up to a point. For the purposes of this three-part tale, his retrospect on Kang suffices--and for those readers who aren't up on Kang's early history, they'll find Stern's information to be concise and easy to follow, if incomplete. 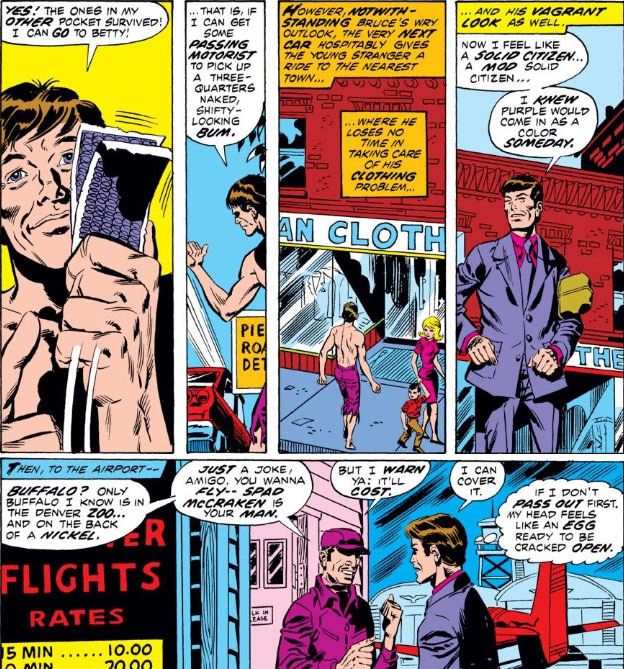 As part of an explanation that takes us into the climax of the story, he really only needs to take us up to a certain crucial development that helps to explain the motivation of the narrator (Kang) and his reasons for setting his plans in motion; yet in addition, Stern adds a twist to the original events that aligns the character's beginnings with revisions to Marvel's handling of time travel which have taken place in later stories down the road. But Stern also brings a joker into this deck--and, clearly, Kang is not amused. 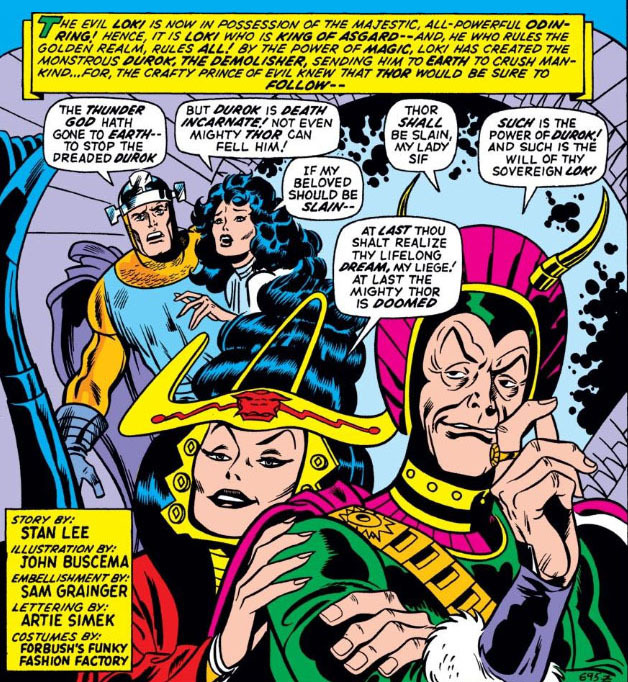 We've previously learned that Immortus, the so-called Master of Limbo, is another manifestation of Kang himself, so he obviously has a stake in all this--but what don't we know about him that we haven't already learned? As we'll discover, we could easily ask the same of Kang. It's no surprise that a villain who calls himself the Melter would mainly spend his time going up against Iron Man--which, unless he was being groomed to be a villain on the scale of the Mandarin, could only take him so far as a viable character. 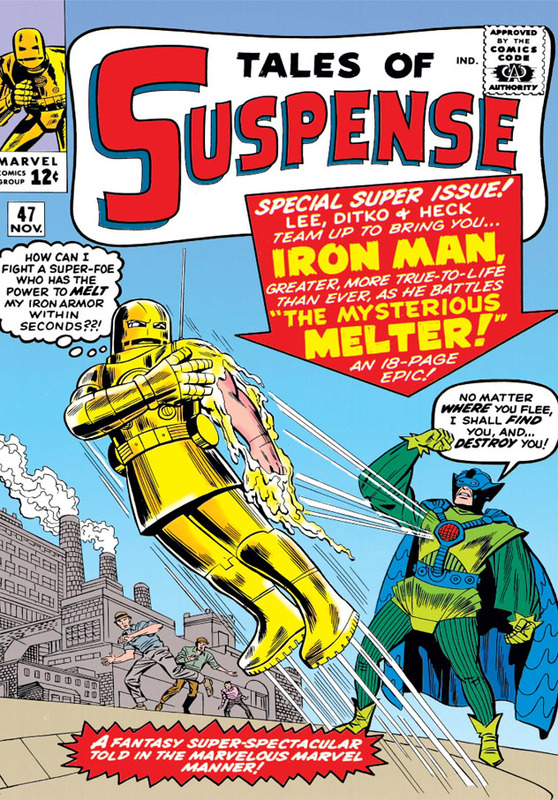 There were only so many times when Iron Man could believably exclaim, "It's the mysterious Melter! The one foe I'm helpless against!" 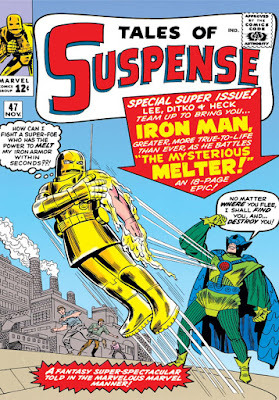 before that sort of thing grew tiresome; after all, Tony Stark is a brilliant engineer who you'd think would eventually upgrade his armor to be able to ward off the Melter's powerful melting beam, rather than be "helpless" every time the Melter showed up at Stark's factory. There was also the fact that, initially, the Melter's source of power, his chest beam, was also his main weakness, a bullseye which an engineer of Stark's caliber (or anyone with 20/20 vision) would be able to pick up on--one repulsor blast to that chest hardware and the Melter's threat is over. One feather in the Melter's cap (or whatever that is on his head) is that he was a charter member of the Masters of Evil, along with the Black Knight, the Radioactive Man, and their leader, Baron Zemo, who upgraded the Melter's beam so that it wouldn't be limited to melting just iron (another factor that would no doubt have impacted on Horgan's ambitious plans for himself). Aside from his activities in Tales Of Suspense in battling Iron Man, his status in the Masters served to give him continued exposure in The Avengers, as well, not only in Zemo's group but also in other Masters lineups. Even so, the Melter would probably be appalled to discover that, in the long run, he would never amount to the kind of threat that he'd hoped to become. For what it's worth, he had a decent run, no argument there; but three costume changes and still no reputation to show for it made it apparent that this villain had perhaps run his course. 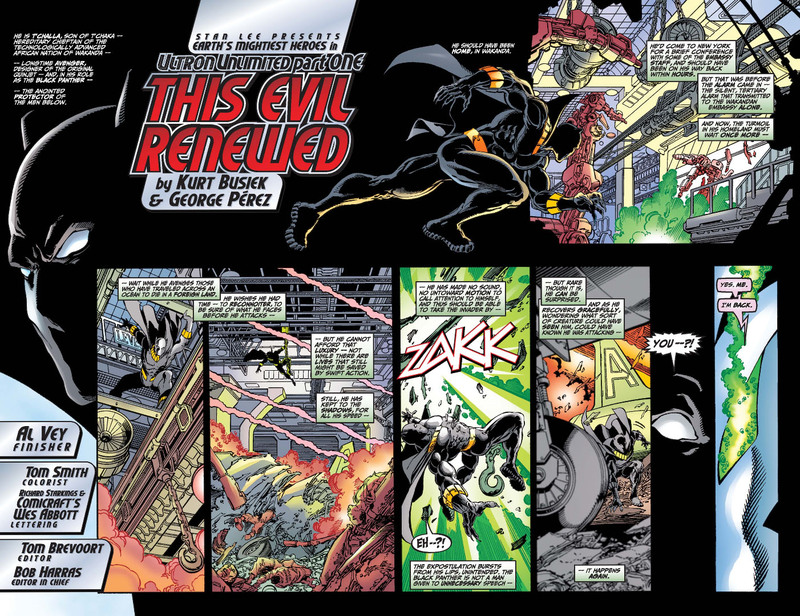 All of that said, it's interesting to note that the Melter's history encompasses over twenty years of Marvel stories. His final fate was a virtual slap in the face that befell a number of Marvel characters who were deemed to be, as Trek lore would put it, "dunsels"--but you can of course judge that for yourself. Following the Avengers' battle with and subsequent capture of the Zodiac crime cartel--thanks in part to one of their members, Libra, switching sides and saving them from perishing in their prison in space--the team is faced with a mystery, when Libra makes a shocking declaration that makes jaws drop from heroes and villains alike--to say nothing of the enigmatic Mantis, who unexpectedly finds herself to be the topic of Libra's claim. 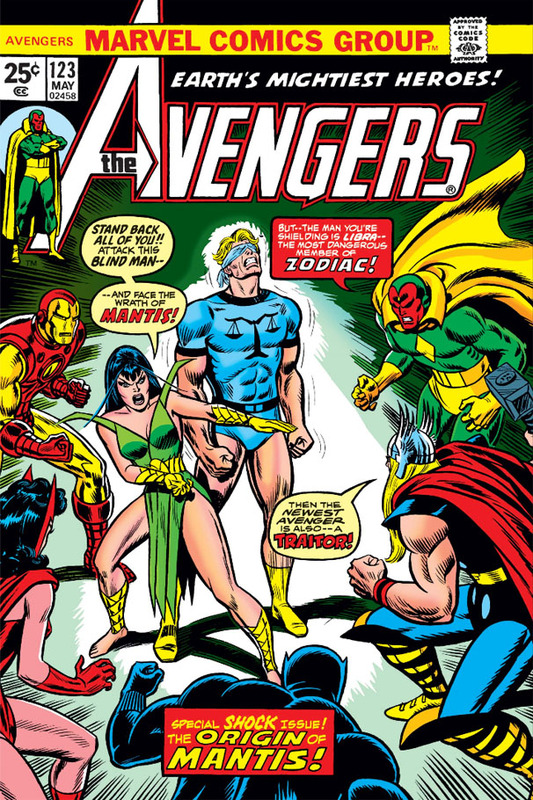 Mantis, who accompanied the Swordsman when he returned to the Avengers and petitioned to rejoin them, has been with the group long enough to gain their trust and their confidence--yet at this point we still know so very little about her, other than the circumstances of how she and the Swordsman met. 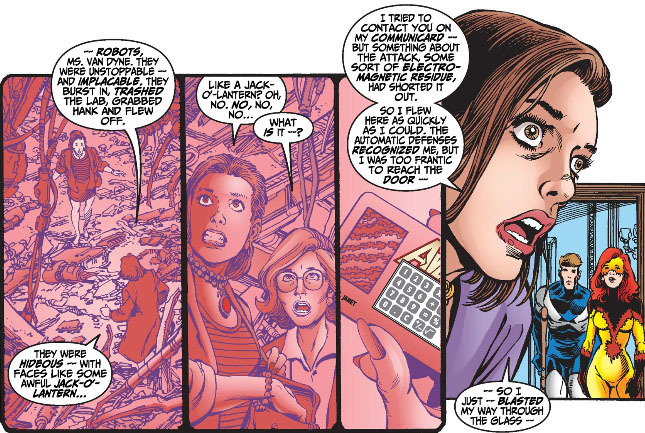 Now we discover she's supposedly linked to a wanted criminal, one who purports to be someone she doesn't even remember; nevertheless, it's the latter aspect that leaves the door open for an explanation from Libra, despite Mantis's vehement objections that clearly indicate she feels Libra should not be given the benefit of the doubt. And along the way, maybe we'll finally settle another mystery about this woman: Just what are those two slender strands extending out from her head? Are they really antennae, à la her namesake? Or just carefully arranged hair follicles styled with a lot of product? The Monster And The Predator! Despite the fact that his abilities stem from both his predatory namesake and the Sub-Mariner, the villain known as Tiger Shark made more of an impression as a ruthless S.O.B. than he did as a viable threat--a small fish who never really stood out in a big pond of super-villains, though it wasn't for lack of trying. A former Olympic swimmer, Todd Arliss accepted treatments offered by Dr. Dorcas to restore his prowess following an injury which sidelined him, only to have Dorcas expand the process by changing him into an amphibian in order to have a partner who would join him in criminal ventures--but Arliss had other ideas. Challenging Namor, he was even able to usurp the throne of Atlantis briefly, before he was sent packing. Later, Tiger Shark would turn up here and there, his fierceness and eye-catching costume securing him gigs in Sub-Mariner as well as other titles, but otherwise nothing to write home about. But his notoreity was assured when, in a Sub-Mariner story from early 1972 where he'd joined forces with Llyra, he killed Namor's father, but escaped before Namor could exact his vengeance. 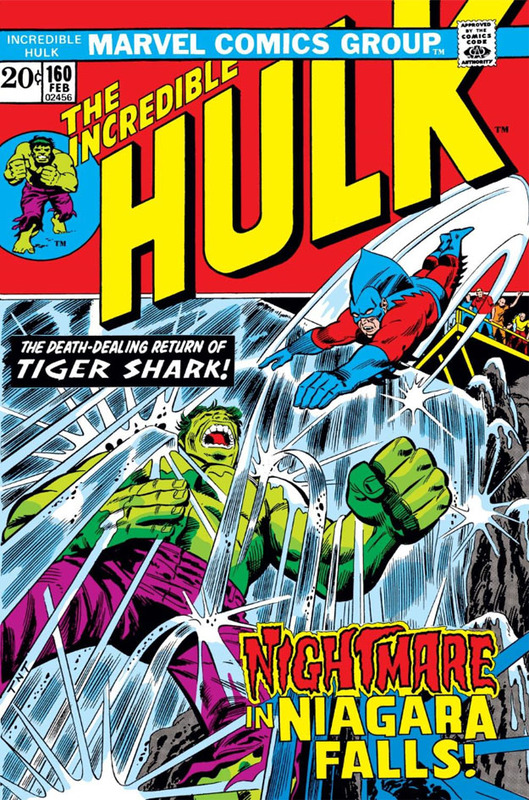 Tiger Shark has never been afraid to engage in battle with Namor--but even he was smart enough to know that he should lay low for awhile until Namor had given up the hunt for him. And so he's secluded himself in a cave underneath Niagara Falls, until the heat is off. 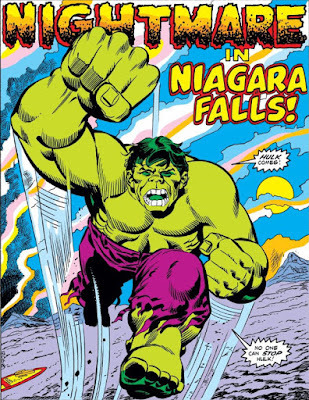 But aside from murderous criminals and honeymooners, guess who else has a hankering to take in the Falls? 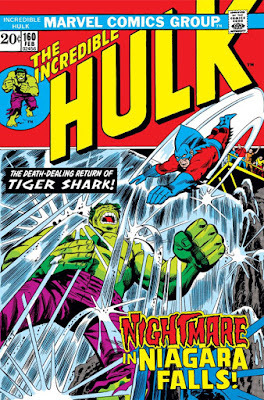 No, the incredible Hulk isn't gunning for Tiger Shark, though heaven help the newlyweds who have picked this moment in time to enjoy the scenery. 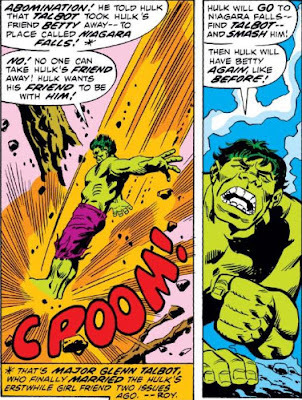 The happy couple featured here is Glenn Talbot and his bride, Betty Ross, who have finally married since the Hulk had been presumed dead and Talbot, who had long pined for Betty, struck while the iron was hot. As for how the heck the Hulk could possibly know the two were honeymooning at Niagara Falls, he has the Abomination to thank for spilling the beans. Yikes! Start packing, Mr. and Mrs. Talbot--your worst nightmare is on the way! 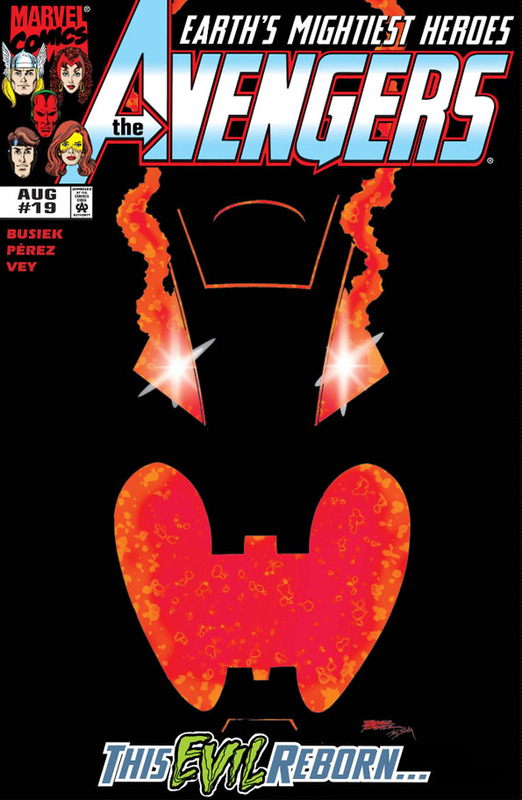 The 2007 series Bullet Points, while squarely falling into the category of a What If tale, has the advantage of being presented as a five-issue limited series, allowing it to take its time as it makes its way through four decades of Marvel history--a method of presentation which avoids cramming a dizzying number of alternate events into one issue and, in the process, reducing their impact on the reader. The story is definitely a notch or two above the typical What If tales that were released in the late '70s and '80s; yet while there is no Watcher who narrates the story and guides us through this book's startling developments, you'll find that it eventually takes on the same characteristics of its predecessors by the time it reaches its conclusion, as it suddenly turns to make its climax a spectacle of elements that had, up to that point, been so carefully and sensibly presented. That said, the bulk of its story is an enjoyable and thought-provoking read that is so well-handled in both story and art that it's a pleasure to simply take your time with it and allow it to do what most stories strive to accomplish: to hold your attention and make you feel for its characters. 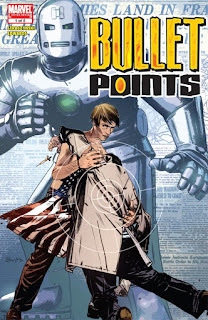 Written by J. Michael Straczynski with art by Tommy Lee Edwards, Bullet Points follows the lives of four individuals--Steve Rogers, Reed Richards, and Peter Parker, and, to a certain extent, Bruce Banner--whose histories are radically different from what seasoned readers may be familiar with, all due to a single incident from the past. As for the series' unusual title, it's understandable if your first thought is of the bullet points commonly used in documents to list key points of a subject or discussion, followed by finding yourself perplexed as to how that relates to a comic book story. 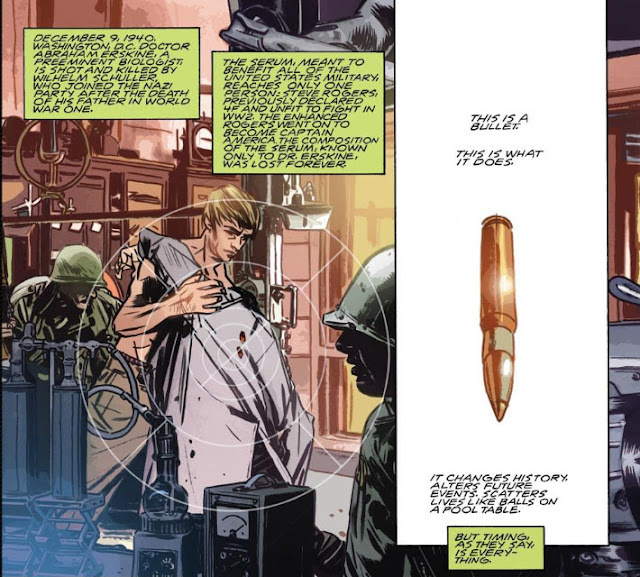 Instead, Straczynski uses the deadly efficiency of a bullet striking its target as a lead-in to illustrate how bullets--in some cases a single bullet--have been used throughout human history to cause death as well as change, with many of those deaths leading to unexpected historical consequences. For instance, there likely aren't too many people familiar with Captain America who are unaware of Project: Rebirth and Abraham Erskine's assassination by a Nazi agent, thereby causing Steve Rogers to be the only person to receive Erskine's super-soldier serum. That agent fired a number of bullets in that hidden chamber that day--but Straczynski needs only one to make his, er, point. It's Erskine's death--or, rather, the date of Erskine's death--that becomes this story's point of divergence from actual events in our reality and thus sets the tone for what's to come. 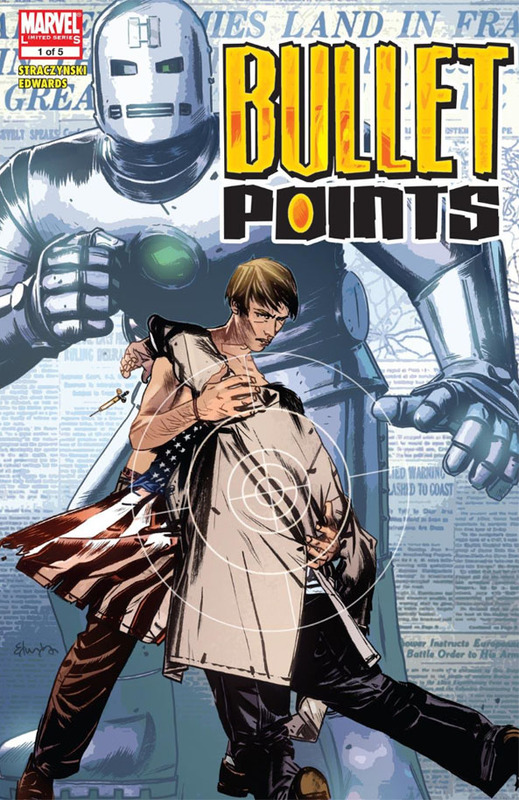 As for how the plot ties into the series title's origin, the association with the bullet points of a document seems intentional, perhaps as a hook of some sort that takes advantage of the phrase's familiarity--though Edwards' graphic of a slumped body in someone's crosshairs on the first issue's cover, as well as what appears to be a gunshot impact in the masthead, completes the picture well enough. Soon enough, it becomes clear that Erskine meets his death just as he did in the original story. But this time, he'll have company. 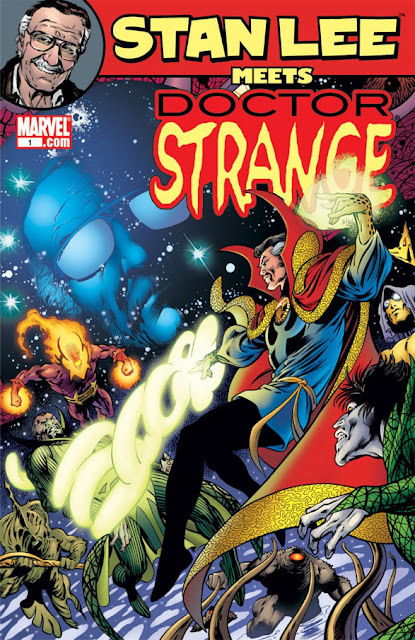 It's an unexpected pleasure to profile another of the Stan Lee Meets... series from 2006-07, where Lee meets and chats with a handful of Marvel characters, an issue at a time, with one or two supplemental stories of the same flavor included. I honestly hadn't expected to return to the series, putting as much stock as it does in the novelty of Lee meeting with his creations, which on its face doesn't seem like much of a draw. An interesting question to ponder might be whether this series would be so entertaining if the reader didn't get the "inside joke" and had no idea who the actual Stan Lee was or how he relates to Marvel Comics, but of course that wouldn't likely be the case. Lee developed each of these characters from the ground up--and while each story is told from a humorous angle rather than a nostalgic one, it still boils down to a bit of harmless fun and, needless to say, very light reading. Previously we took a look at Lee meeting up with the Silver Surfer; this time, though, Lee takes a turn toward the occult, even if it's not quite what even he expects to find. Ah, but on the inside, their stories may ring familiar, at least at first. A method of entry which, nearly twenty years later, Perez obviously figures "if it ain't broke... er, break it again." While in 1999, he's moved to Nugent Technologies--still in New Jersey, but definitely not in a district zoned as residential. Fortunately, robots don't care either way. 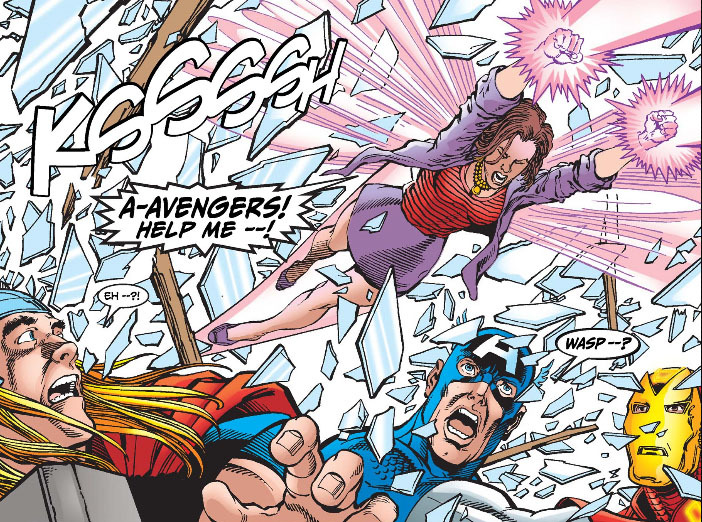 We know that Jan had a distinguished stint as Avengers Chairwoman--but sometimes she can't make a decision to save her life. In this case, she's flying roughly the same distance (from New Jersey) to the mansion--and we have to figure that, due to the emergency, she was flying as fast as she could. 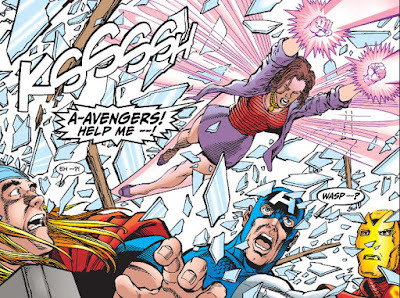 Above, though, she's too frantic to use the mansion's door... but, previously, she chalks her haste up to exhaustion (though not too exhausted to generate a bio-electric blast powerful enough to smash open a large window). 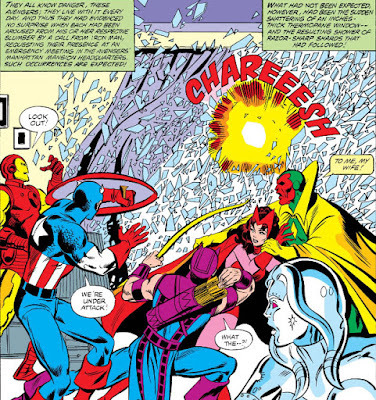 ...to the beautiful panels of the Avengers' battle with the second bride of Ultron, the deliciously evil Alkhema. Last time, the Scarlet Witch was cheated out of the opportunity to battle Ultron once more, and, unfortunately, no luck here, as well. But the cocky Alkhema will find that Wanda is eager to make up for lost time, regardless of what adamantium-constructed foe is challenging her. And just for future reference, Alkhema--nobody likes a smart mouth. 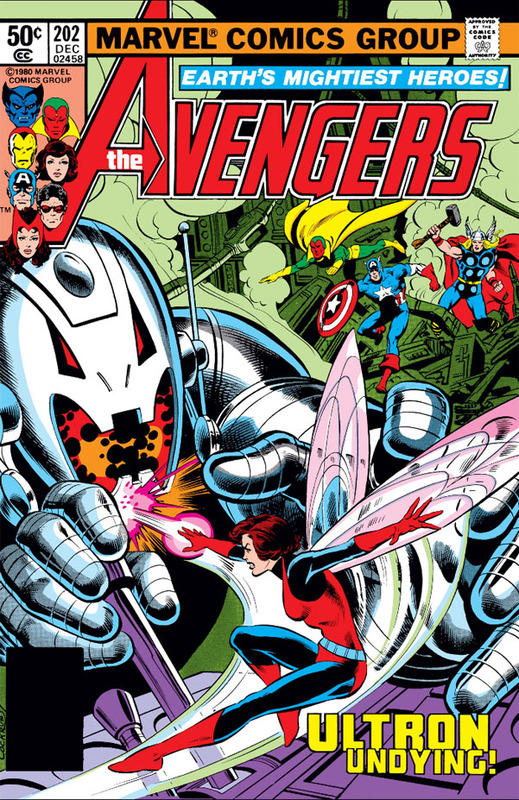 For those readers who enjoyed the appearance of Ultron during Jim Shooter's run on The Avengers, where the metal monster seemed to finally meet his end in a staggered four-issue story that culminated in a pitched battle at (of all places) a nunnery, his reappearance in the mag thirty issues later was likely met with anticipation of a similar saga taking place--especially with artist George Perez once more handling the art, while writer David Michelinie would be basing his script on a short story by Shooter. Yet high expectations may be one of the reasons why this story may have been met with disappointment by some, playing as it does on the return of one of the Avengers' deadliest and most persistent enemies but limiting the character's threat to barely over one issue. Ultron, as most are aware, owes his indestructibility to... well, he certainly owes it in part to his ability to rise again from the ashes, or the shards, or the fragments, or from whatever explosive and devastating fate he suffered in battle with the Avengers. Ironically, though, he has a human scientist to thank for the true reason why he's so formidable a foe. At the early stages of his development, this self-evolved robot's sole weakness could be found in the twin electrodes at each side of his skull; but after seeking out the metal known as adamantium and using it to form a new body for himself, Ultron made himself impervious to any physical force used against him. That and his designs on the human race make him a near-perfect and perpetual enemy for the Avengers, since he can challenge and overcome even their strongest members. 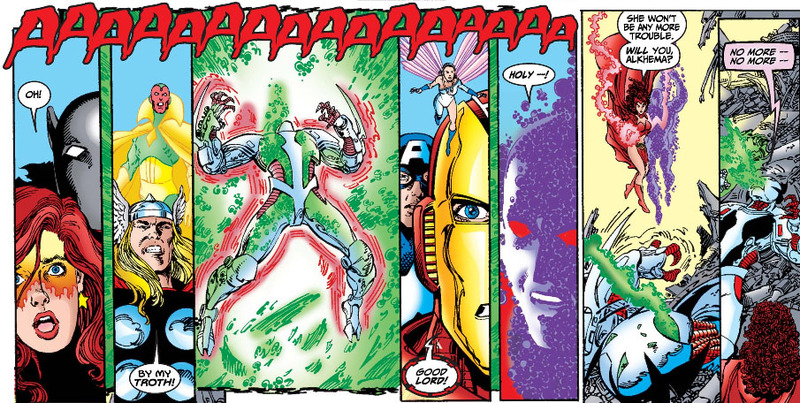 In the past, Ultron's plans have required the Avengers to bring their A-game--not only in their inevitable confrontation with him, but in trying to piece together what he's after and what his ultimate goal is. What will be the key to beating him, they end up asking themselves, yet being forced for the most part to play it by ear--bravely battling him in the face of almost certain death. 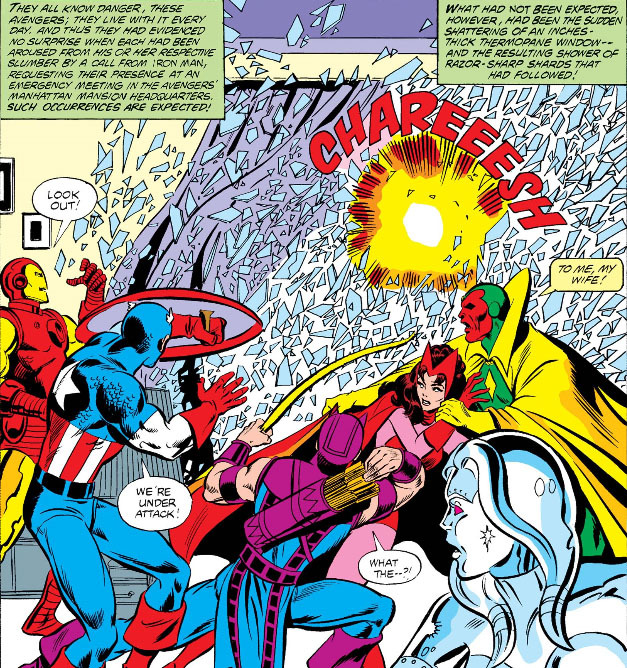 In their last encounter with Ultron, the Avengers found that one of their own, the Scarlet Witch, held the key to his defeat: her mysterious hex power, known for disrupting probability, caused a malfunction in the device within him that allows him to rearrange the molecular cohesion of his adamantium body, thus making him vulnerable to attack. 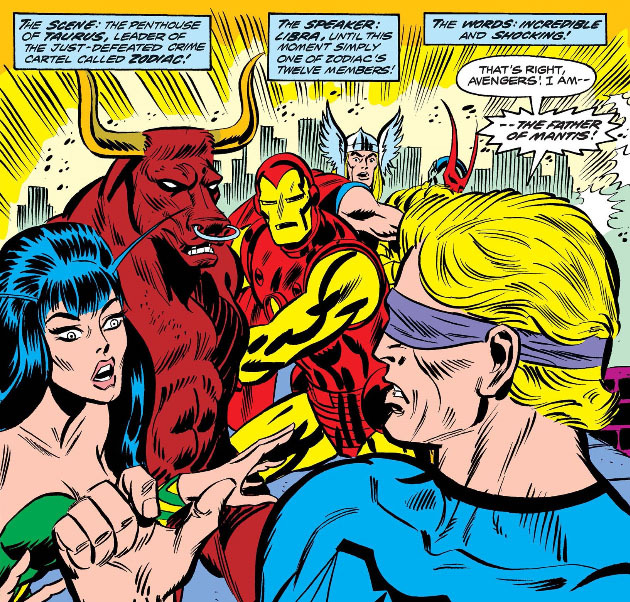 That precedent virtually ties the hands of any scripter who features Ultron in an Avengers story where Wanda is part of the team lineup, assuming that Ultron hasn't compensated for it in some way (which indeed occurred in a later story, for all the good it did his second bride, Alkhema). 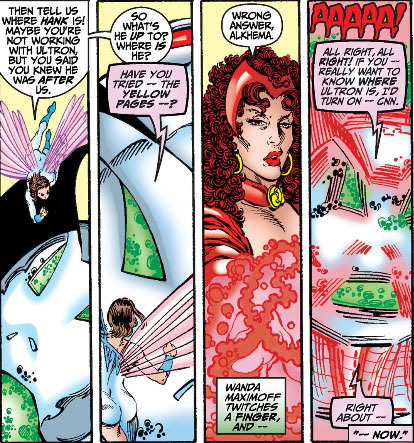 Here, however, the fact that Wanda has the ability to stop Ultron practically forms the core of this tale; so the challenge for Michelinie will be how to craft an interesting story, knowing that going in. Whether he succeeds or not is debatable. 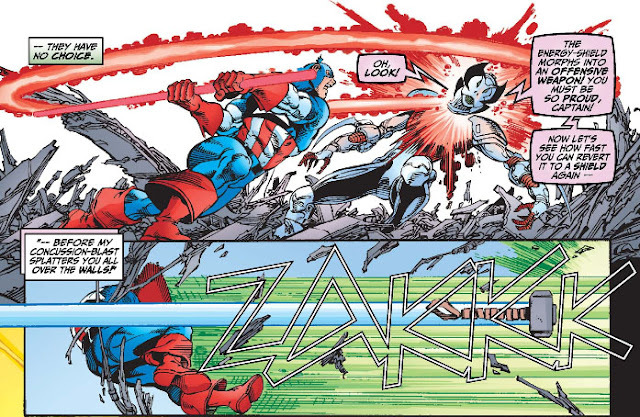 But he does have one thing in his favor: Ultron himself, a character whose reputation as one of the Avengers' most daunting foes precedes him. 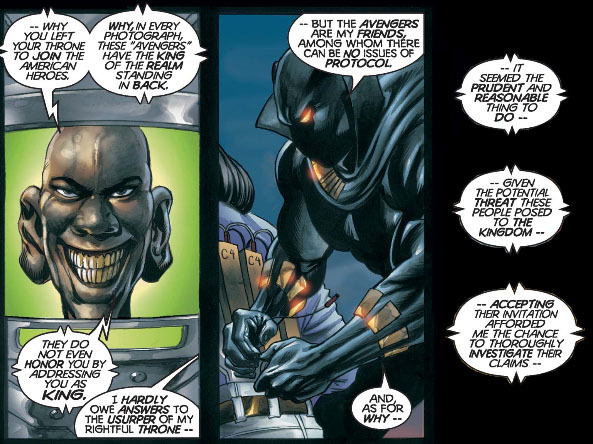 During the early issues of the Black Panther title which launched in late 1998, the Panther once more finds himself in the United States, in what becomes mostly a focus by writer Christopher Priest on Wakanda's sovereignty and the political conflicts that have been ongoing with the U.S.--disagreements which have been coming to a head due to Wakanda's policy of not sharing its technology with other nations as well as remaining mum on its strategic and tactical capabilities, while keeping a tight rein on sales of its highly-sought vibranium ore. But the Panther has also had to deal with internal struggles. While T'Challa has been occupied stateside, a man named Achebe stages a coup that allows him to usurp the throne of Wakanda--though eventually a compromise is reached where Achebe is allowed the role of Prime Minister while sharing power with the Panther's stepmother, under the condition that the Panther remains in the U.S. There's little doubt that Achebe, whose hold on sanity is tenous (he once sold his soul to Mephisto, which should tell you something), will eventually move to be crowned King--and as he prepares to do just that, he makes an assassination attempt on the Panther during a night of civil unrest and rioting in New York, which the Avengers help to quell. 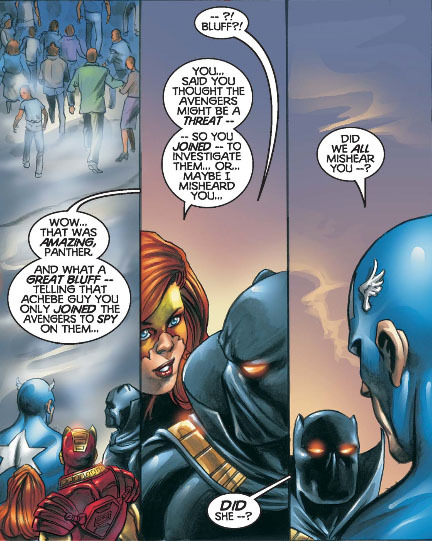 But while the Panther exchanges words with Achebe, who contributed to the carnage by also placing bombs among the crowds, an open comm link with his teammates results in secret information being disclosed regarding the Panther's original motives for joining the Avengers--information that will put his relationship with his friends and allies on shaky ground. 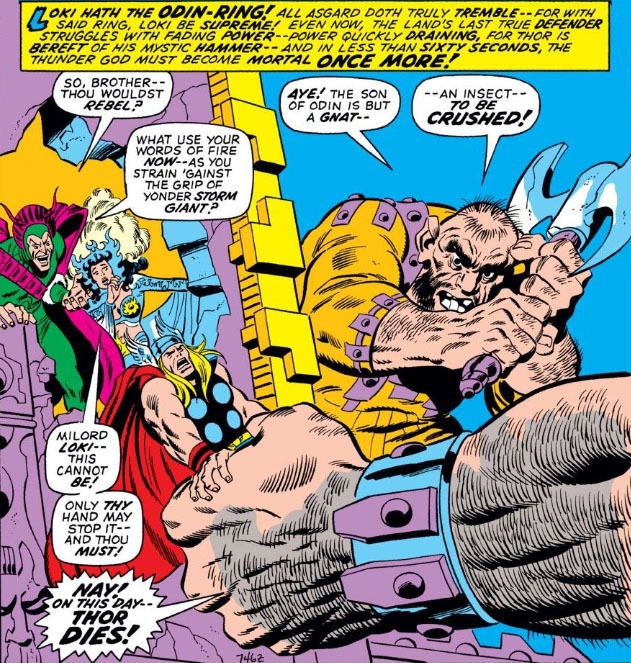 It's been a demolishing few issues for Thor, the God of Thunder, who strives alone to overcome his despot half-brother, Loki, after he usurped the rule of Odin by taking possession of a single piece of jewelry--the Odin-Ring, which, by law, makes its wearer the lord of Asgard while also bestowing a portion of Odin's might. Forced to retire to his chamber and undergo the Odin-sleep, Odin is removed from the ensuing chaos for the duration, while Thor was compelled to deal with a deadly, destructive creation of Loki and his ally, Karnilla, the Queen of the Norns--Durok the Demolisher, whose mandate by Loki is to annihilate all mankind on the planet Earth and, in so doing, bring about the death of Thor, who would naturally act in their defense. 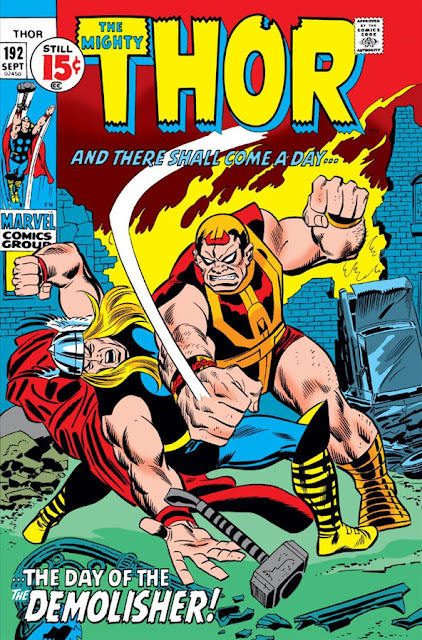 On Earth, Thor found Durok to be a formidable foe, whose strength exceeded his own and who could even resist the impact of his mystic hammer. 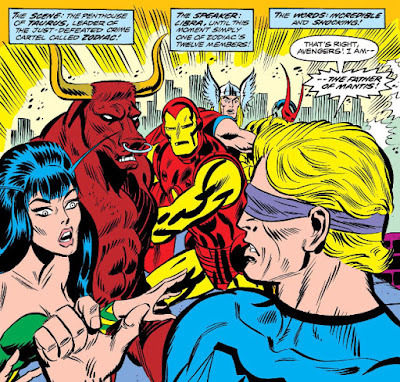 But as Loki transported Durok to different locales as he continued to toy with Thor, he added to Thor's frustrations when he announced that he would wed Thor's beloved, the lady Sif, while Thor was left with no choice but to remain on Earth and continue to attempt to stop Durok's onslaught. Meanwhile, Thor's friend, Balder the Brave, prevented from helping Thor directly, entreated the Silver Surfer to battle Durok at Thor's side; but the Surfer went a step further and vowed to stop Durok, discharging Thor from his duty and leaving the Thunder God free to return to Asgard to battle Loki anew. 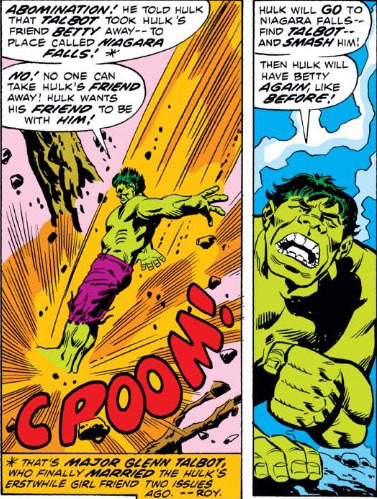 *We'll have to cut new Thor scripter Gerry Conway some slack for the oversight that Thor has no such handicap while in Asgard; though it's also possible that artist John Buscema mistakenly drew the scene thus without any direction from Conway. The odds surely seem to be against Thor escaping certain death, and even more against Blake should he appear in Thor's place. Has Loki won at last? Not if Thor has anything to say about it, according to this issue's furious cover. As much as we have to sympathize with the people of Earth right now, things are looking dire for the Asgardians, as well, since a madman now sits the throne and Odin's law demands that Loki, the wearer of the Odin-ring, be obeyed. But unlike Balder, who has pledged his loyalty to Karnilla, Queen of the Norns and ally of Loki, there are those who refuse to just stand by while Loki leads them all to dishonor and most likely destruction. 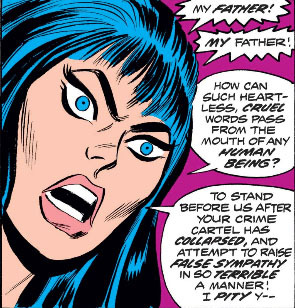 For instance, Thor's beloved, the Invisible Girl the lady Sif, doesn't stand by at all--she slouches in despair and helplessness, because crumbling in tears is how even female goddesses behave to writer Stan Lee's way of thinking. But others, such as Thor's comrades, the Warriors Three, have no intention of turning away to sob when they can still act. Brava, Sif! Glad you remembered that Asgardians live to dare. But the danger to Earth--and to Thor--remains, as this issue's cover heralds the battle to come. Almost immediately following the dramatic turn of events where Odin, the All-Father had stepped in to save his son Thor from the deadly clutches of Hela, the Goddess of Death, both father and son found a new challenge awaiting them within the halls of Asgard: Odin's adopted son, the evil Loki, had seized the throne by donning the Odin-Ring, which not only compels all Asgardians to give their loyalty and service to the wearer but which also apparently channels a measure of Odin's own power through it. 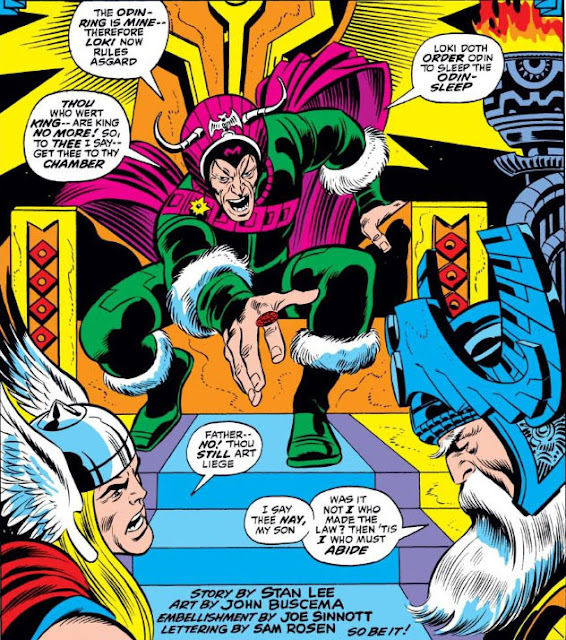 And with Loki now the ring's master, the implications for Asgard are dire indeed, as even Odin must concede--for it's his own law that forces even the once-Lord of Asgard to heed the commands of he who wears the ring imperial. Undoubtedly, investing such power in a piece of jewelry that could be stolen by anyone who wants to usurp the rule of Asgard without raising an army or brandishing a single blade wasn't one of Odin's wiser moments. 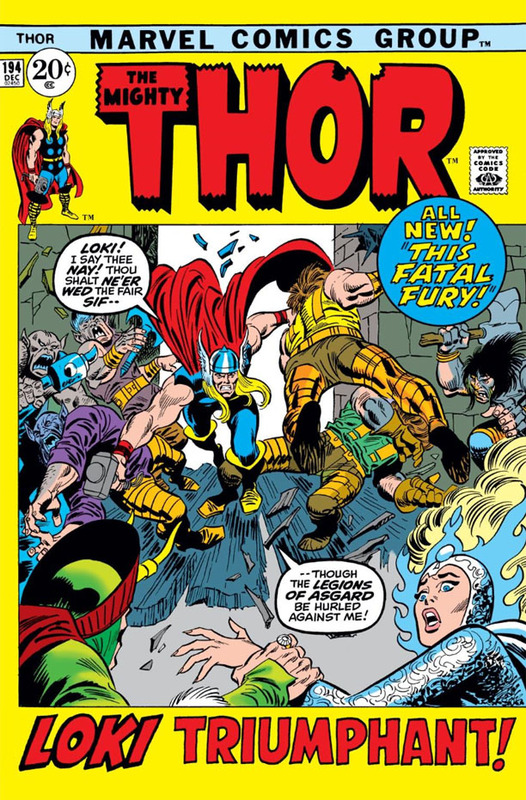 This 1971 story marks long-time Thor writer Stan Lee's final tale for the book (though Lee scripts the title's 200th issue, in what looks to be an inventory story inserted in the midst of new series writer Gerry Conway's Pluto story). For comics readers who were reading other titles of Marvel's books during this time, the style of the story takes some getting used to, since it comes at a time when Marvel is experimenting with toning down its frequent use of exclamation points, while (initially) substituting no other punctuation at all. The result is that some dialog falls flat where it shouldn't. As an example, take the scene where Odin raises a rash hand at Thor's insistence that they strike back at Loki's power play. Lee's script would be otherwise sufficient for the moment, yet there is nothing to *ahem* punctuate the emotions in play. But with some adjustments, the scene is given more spark that helps to strike the balance that Marvel is looking for. 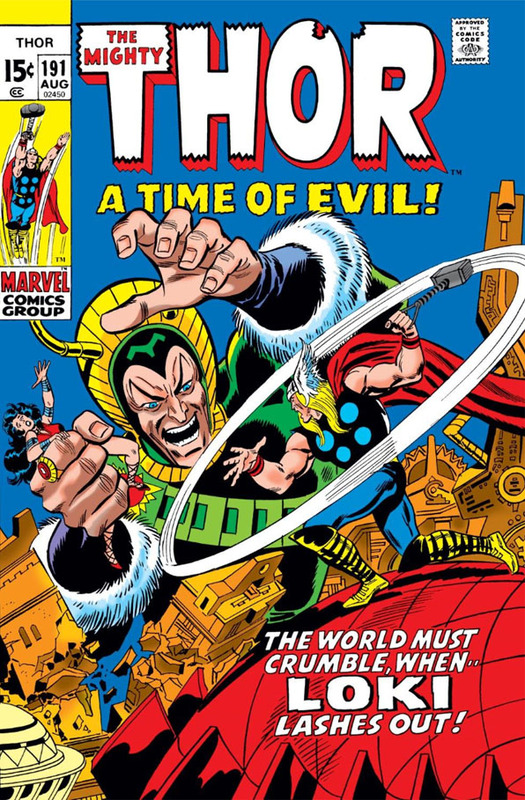 Of course, punctuation is the last thing on the minds of the Asgardians at this tense moment--and the issue's striking cover gives us an idea of what stakes are involved, and just how far Loki is willing to go in not only solidifying his grab for power, but in fatally dealing with the brother that he has long despised.